I founded the par Terre Dance Company in 2005 to argue my vision of hip hop dance within the choreographic arts: for me it is a high-performance, technical form of dance, pure and destructured, far removed from the usual demonstrative or narrative clichés. I did not make a conscious decision to become a choreographer. I simply felt the need to change the image associated with hip hop dance and promote the virtuosity of its performance after spending a long time as a break dancer* taking part in battles*, and performing for other choreographers. I dream of being able to bridge the gap between the battle audience and audiences in the field of choreographic arts, who generally have opposite agendas. More often than not, hip hop dancers feel that performing on stage disrupts their dance and their very essence. I base my work on this premise and address the issue by challenging the form and intended purpose of on-stage hip hop performances. I take an interest in the geometric transposition of hip hop moves, which are usually comprised of head-on, circular movements performed within a space defined according to standards, namely the stage. I examine the relationship between the performer and the audience, the relationship to the partner and the sense of ‘togetherness’ on stage. Mad about dancing, but a latecomer to the profession, I was fortunate enough during my studies to acquire a knowledge of such disciplines as physics, maths, literature and linguistics. These are now the tools I use to open up new choreographic horizons in hip hop dance, which, albeit a young discipline, has until now often been choreographed by artists from other backgrounds, such as contemporary dance, the circus, or the visual arts. I am fascinated by the perfection of movement, and I am trying to encourage a whole new generation of hip hop talents to enter a career as performers, by giving them the opportunity and desire to apply their talent for the benefit of a genuinely choreographic hip hop universe. For me, the essence of hip hop lies in a desire to reconnect with our animal instincts, a need for physical exuberance, a desire to reflect the forms and energies that surround us. By combining freedom of movement and technique, hip hop dance speaks to our souls. 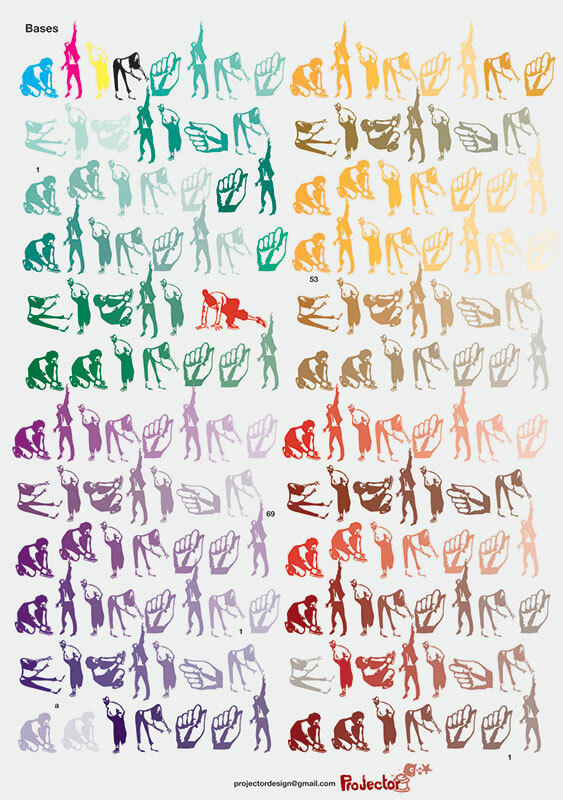 By choreographing its moves, I am seeking to amplify further the powerful sentiments that emerge. Hip hop dance and tribal dance share one significant characteristic: the dancer “inserts” his/her body into the ground to the powerful accents of the music. Like the hammering beat of a war dance, the energy that emerges is deeply organic, almost animal-like. For a hip hop dancer, dancing has something of a ritual about it. The par Terre Dance Company takes its name from the almost sacred relationship to mother Earth, where the Earth has the role of a deity: “par Toutatis!” (a Gallic exclamation invoking the name of a Celtic god) becomes “par Terre”. The expression “par Terre” also reflects our highly scientific attachment to the laws of Nature, starting from the premise that the laws of physics governing the movement of the human body are peculiar to planet Earth and our environment. For me, dancing consists in placing one’s body in resonance with the laws of nature in order to draw closer to the beauty of mother Earth. To choreograph is to feel the precision of the body’s movements and then to place them in a wider context of time and space. In today’s world, we are surrounded by hardness, squareness, immenseness. Faced with an inert environment, the mechanization of our lifestyle, how does the body react? Through hip-hop dancing, the contemporary body endeavours to appropriate the constraints of its urban environment all the better to be free of them. Through the soles of our shoes, through the concrete, simultaneously incorporating the right angles of the capital letter T for Terre, or E for Earth, of which this Earth is constructed, hip hop dancing is a dance in the present, a spontaneous resistance movement on the part of the living. Hip hop dancers are urban warriors. Hip hop dancing injects new meaning into dance and its expression. My dance transgresses movement. My feet are sucked up by the concrete. The cement blocks around me try to mould me in their image. I’m submerged by the crowd, it engulfs and steers me along the streets. Drifting with the linear tide, I take control of my center of gravity. I dive to the tarmac, beneath the surface where other people move around. My freedom awaits me in the space built for legs and feet. I fold myself up and climb inside, to finally shake off the laws that govern the surface. Close to the asphalt, where I live, my body’s my own at last. My energy is channeled into a tighter spot, and the power of my moves is magnified. My body becomes a compact ball, which I bounce against the concrete. Now, with no bottom or top, no hands or feet, I cannot fall any more. Falling becomes a controllable mode of locomotion. This is the first of my poems appearing in the Manual of the City Warrior. It expresses the feeling of freedom one can experience when break dancing. It is in quest of just such a feeling of freedom and pleasure that many performers are attracted to hip hop dance or, or to dance in general. However, one does not dance in the same way when one is dancing “for oneself” as when one is dancing on stage in front of an audience in pursuit of an artistic purpose. The training session or the ‘battle’ is an encounter with oneself, a kind of ceremony during which one abandons oneself to the music, where one shares the dance with a group of initiates, where one acquires and maintains the strength to exceed one’s limits. The stage does not always offer these sensations, and many dancers prefer simply to channel that strength into short “shows” that reflect a jubilant, demonstrative vision of dance. I am seeking to reconcile the notions of freedom, pleasure, technical progression and self-transcendence peculiar to hip hop with advanced, demanding theatrical performances that question the place of the human being in the modern-day world. While first-generation hip hop dancers readily combine all manner of moves and are able to segue between arm waves and break dance steps, nowadays dancers specialise in one or more disciplines of hip hop dance (break dancing, popping*, locking*, etc.). As a break dance specialist, I attach great importance to ensuring that the energy and technical skills are demonstrated flawlessly on stage, and are pushed beyond their limits. The dancers in the par Terre Dance Company are all exclusively hip hop dancers, break dancers, poppers or lockers and have come from in or around the battle environment. Battles are special moments between dancers, where forms and energies are brought into confrontation, transformed and updated. They are a source of vitality and inspiration for hip hop dancers. I am not setting the stage environment against the battle environment, and there is no confrontation between the moves that I develop with my dancers on stage and the dance you see in battles. They stand apart from and complement them, since they are developing the same energy but in another context. 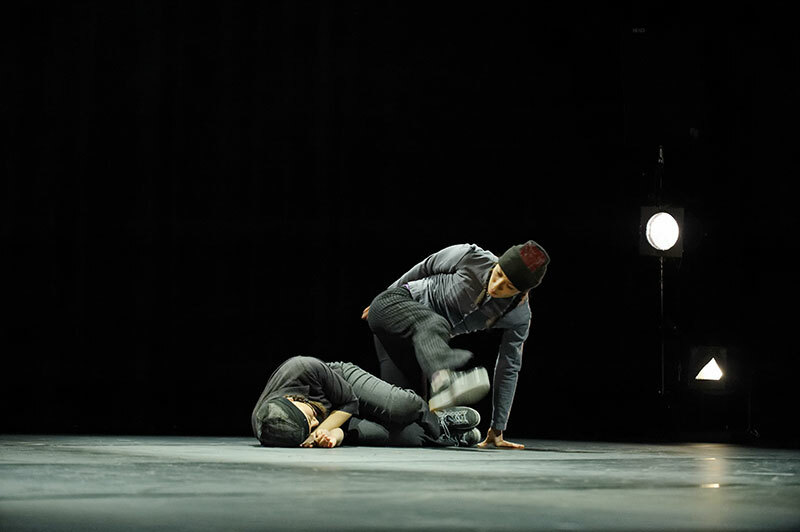 The move remains essentially “hip hop” in the sense that it is not intentionally hybridized with other body languages such as those found in classical ballet, jazz, or “contemporary” dance. I take my inspiration from many influences (mechanical principles, martial arts, couple dancing, etc…) throughout my choreographic research, but the bodies of the dancers remain firmly rooted in their own characteristic energy. I place my dancers in choreographic situations that enable them to push beyond the automated gestures and limits associated with the formal “traditional” contexts of hip hop – such as that of the circle*, shows or battles, as well as those linked to their musical traditions. My shows are nurtured by the imagination, by the different ways of experiencing dance open to hip hop performers. Most of my productions, therefore, are choreographed to highlight a particular discipline: PROMENADE OBLIGATOIRE (2012 production) is a long “walk for eight poppers”, Yonder Woman (2010 production) is a duet for two b-girls. In my shows, dance is the purpose. I am not distinguishing between the technical excellence of body language and the intention conveyed by the dancer. When bodies in another manner, new openings arise for movement: new directions, new rhythms, new ways of building, new ways of projecting energy… What is interesting for me are the concrete parameters that exist for creating a meaningful situation. As far as I am concerned, it all begins with the essence of the gesture, the posture of the body, its position in space and its relationship to the ‘other’. And hip hop is a genuine breeding ground for postures, principles and energies packed with meaning. is a duet for two b-girls. In my shows, dance is the purpose. I am not distinguishing between the technical excellence of body language and the intention conveyed by the dancer. When bodies in another manner, new openings arise for movement: new directions, new rhythms, new ways of building, new ways of projecting energy… What is interesting for me are the concrete parameters that exist for creating a meaningful situation. As far as I am concerned, it all begins with the essence of the gesture, the posture of the body, its position in space and its relationship to the ‘other’. And hip hop is a genuine breeding ground for postures, principles and energies packed with meaning. Hip hop is a sharing culture, based on cultural mix and the mixing of cultures. It came about due to a certain context, namely the urbanisation and standardisation of our lifestyles. With the construction of the first large urban complexes in the major immigrant cities, people from very different cultures were, for the first time, forced to share confined social spaces. They therefore invented new customs, new distractions and new modes of expression. The essence of hip hop culture consists in creating new forms by acquiring and experimenting with existing forms, as is shown by sampling*, the music-making technique on which hip-hop is based. It was by playing on a loop short sections of existing music tracks taken from soul music due to its danceability that the first hip hop DJs* invented the first breakbeats*, and got the first “Breaking boys”, “B-boys” and “B-girls” (break dancers) dancing. Breakdance, which was thus born in the Bronx in the late 70s, took its inspiration from “Rocking”, a gang dance popular in New York at the time, as well as from Kung Fu, capoeira, African and Indian dance, gymnastics, yoga, tap dancing, and even animals, such as wild cats… All these inspirations derived from collective popular imagery have contributed to this new universal dance, the result of thousands of cultural references united by strong principles and thus federating a whole new diverse “nation”: powerful, extroverted energy, angular shapes reflecting the shapes of the city, bounce steps rooted in the ground… When they move to the rhythm of this new traditional war dance, hip hop dancers all over the world are united by a common essence. I have been conducting a theory and practice workshop in breakdancing and hip hop at the Sciences Po Paris since 2012 entitled Hip hop, a contemporary culture. I felt it important that the word “hip hop” should be associated with the word “contemporary”. In actual fact, my choreographic work consists in redefining and pushing back the technical limits of hip hop dance and its choreographic possibilities; it thus narrows the gap with the ethos of contemporary dance, which questions the meaning of dance and art. Hip hop is a contemporary, unifying, global culture. Its strong relationship with the urban environment and a city creates a link with our daily lives through its inspirations, energy and forms. The characteristic features of the contemporary ethos that fires our era are pragmatism, specialisation and abstraction, values that resonate strongly in hip hop dance. Just as hip hop dance constantly experiments with its own forms, so the contemporary ethos plays on its own defining values. Thus, although hip hop culture can claim to have recent, identifiable origins and a history still in the process of being written, it is first and foremost a highly contemporary philosophy whose thinking rejects anything that might confine, or define it, one that continues tirelessly to question and update itself. I find that hip hop dance sometimes suffers from a “legitimacy” complex: many shows claim to be “authentic”, by transposing the street onto the stage (by using a lamppost, or a bench), or by continuing to cling to social or ethnic issues. This only serves to maintain clichés and restricts artists to an exploration of only one facet among the many possibilities available in an art that cannot be reduced to a basic context, but that instead feeds on universal values. 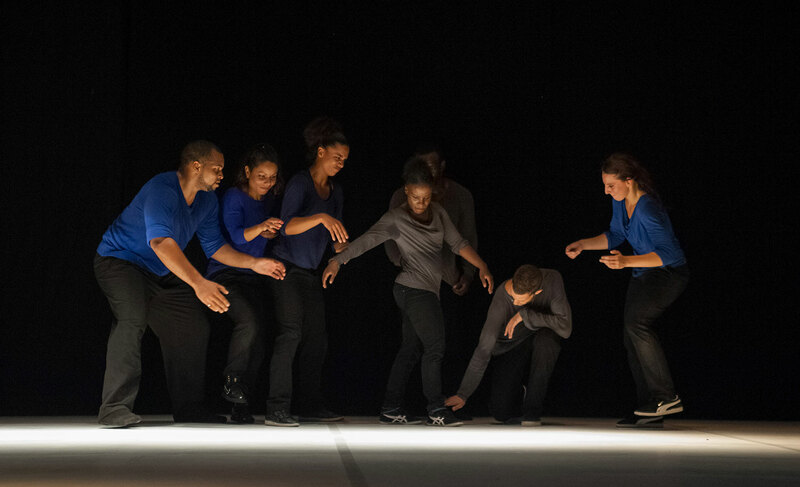 The shows that I develop with the par Terre Dance Company are a far cry from the performances generally associated with hip hop dance, they awaken other thoughts and ideas. By stripping down wherever possible the visual symbols on the stage (clothing, props, lights) and by placing dance within new frames of reference, I am keen for my dancers to be seen as individuals immersed in a state or an issue relating to the universal, rather than as representatives of distinctive values that derive from belonging to a particular culture. The essence and energy of the movements are preserved, but the ritual codes are sabotaged and pared down, in order to compose abstract, conceptual choreographic arenas. It was the warlike essence of breakdancing that drew me to this discipline in particular. Before I began breakdancing in 1999, I danced very little. I felt that dancing was too much about seduction or showing off. I assiduously practised gymnastics and martial arts, and the idea of overstretching oneself, of being able to execute difficult movements appealed to me far more. The freedom of creation and the idea of playing with conventions also drew me towards hip hop dance and culture. My capoeira teacher one day asked me to choose between capoeira and breakdance: he accused me of adding feeble or pointless embellishments to my fighting moves. I was naturally prompted to take up dance by the need to break the rules and explore beyond the efficiency and usefulness of movement. In my style of breakdancing, I like to invent my own movements or combinations of movements and give them a personal twist. Hip hop culture teaches us to be unique and stand out from the crowd. The first groups of dancers formed something akin to a band of superheroes: every physical particularity was transformed into an asset. To this day, individual dancers within a breakdance group will play on their flexibility, stature, or speed and complexity of moves, etc.. Hip hop teaches us to develop our own identity from strong principles. The task is not to reproduce, but to base new creations on one’s inspirations. And so therefore, a hip hop show for me was not simply about transposing onto the stage dance movements taken out of context. New constraints impose a new approach, renewed creativity. Dance that is shown on stage should be devised and played out for the stage. My choreographies are like kata in martial arts: they consist of processes, sequences of movements and dance principles that enable the dancers performing them to feel enriched and experience them as a kind of treasure hunt, or obstacle course, something that involves them deeply and stimulates them to exceed themselves physically and mentally. The finesse of their interpretation is implicit in what they must play out on stage: they must achieve it by “being”, and not by thinking. I see to it that the movements are balanced between the left and the right sides of the body, to ensure that the body is not damaged, but “educated” by the dance process. My choreographic methods are reflected in the breakdance lessons I am also developing, which I give in my course at the Sciences Po Paris. I start by instilling into my students an “animal-like”, “useful” relationship to the movement: how to optimise each posture to create maximum room for manoeuvre, how to use each posture to move around, how to move most efficiently from one position to another… Starting with a useful movement, this is then suffused with meaning to enable the bodies to feel the dance emerge from within them. I then incorporate certain form limitations into the dance to refocus the energy around the centrifugal force, or instead develop movements along lines or arcs of circles. Then the choreographic construction work starts by transposing a basic movement in different directions, ranges, heights, trajectories or energies, integrating certain “obstacles” to the movement, or composing logical progressions combining basic movements and personal “variants*”… My objective is to instil conscious reflexes into the bodies of my dancers to allow them to build their own moves with as much freedom as possible. My dance moves are designed to shake up stagnant mental images. Since my lifestyle only uses a fraction of my body’s physical capabilities, I show respect for my own intrinsic human nature by developing useful movements. I guide my body beyond postures intended for social display. I compose my own dance from positions that have no meaning in everyday life. All useful movements tend towards an ideal form, I optimise my dance, however, based only on the constraints I choose to apply. So as not to react slave-like to an accumulation of images, I try to define principles that fire me with passion. I do not dig deep into my memories to find my inspiration, instead I analyse and apply relative constants to my body and my perception of style. I create openings and I slip inside. I make folds in order to unfold them by changing direction. I roll myself into a ball, switching from one point of support to another. When I describe my creative process, I use the term “constraint” a lot. I am not juxtaposing the notion of constraint against that of freedom. To the contrary, freedom for me is acquired and cultivated. Learning to dance consists in controlling the factors that define our manner of moving around and those that limit our movements. In order to progress and innovate, a dancer must constantly push back the limiting boundaries. By setting additional constraints for my dancers, I am interacting with the workings of their dance. I bring about a change in the place of creativity: new impediments give rise to new solutions for freedom. These workings are very familiar to hip hop dancers, whose dance is based on a desire to overstretch themselves. They seek constantly to transcend the laws of gravity and the human body, and deceive the visual and sound perceptions of their audience. Another fundamental principle of hip hop dance is taking risks: dancers always attempt to execute movements that are more difficult than the ones they can already master, they like to show their very latest fancy “power moves*”, as if filing a patent before an expert audience. The overcoming of constraints and the taking of risks are what guarantee the “vitality” of hip hop dance. They are therefore at the heart of the show’s construction. I set difficult technical constraints on my dancers in order to push them to their limits, and I ensure that the path they must follow on stage is composed alternatively of areas conducive to personal interpretation and those left to random improvisation and risk-taking. Thus, the quest for freedom is an underlying part of each of my productions. I have practiced a lot of martial arts, especially capoeira, as well as Brazilian jiu jitsu, Viet Vo Dao and Wing Chun. One of the features of these practices is the relationship to the partner, which is one that involves physical contact. However, while the contact with the floor is one of the basic principles in breakdancing, personal contact with the partner is very under-exploited by hip hop dancers, the latter creating an empty space around them in which to dance their ‘circle of life’. The contact with the floor, the relationship with the Earth, are what prompted me to practice breakdancing rather than any other hip hop dance style. Nevertheless, I greatly missed that contact with, and relationship to, a partner when I decided to stop martial arts and concentrate solely on dance. That’s why I now make it one of my main research goals as choreographer. I developed a series of technical exercises aimed at introducing contact into the dance moves that are inspired by martial arts and mechanical principles. I bring together arms, legs and bodies in a dynamic, circular fashion within a reduced space. It’s as a result of this approach that I then went on to create a combination of moves with the dancers for several persons, where energies specific to hip hop dance, such as the centrifugal force in breakdance, can develop and blossom. 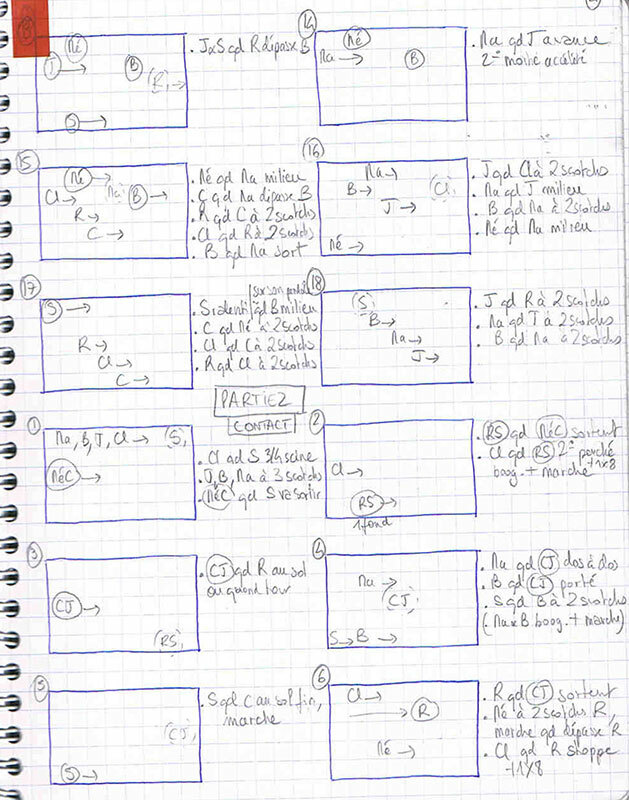 I wrote a research report on these processes, which appeared in Repères, cahier de danse n°25 : Quel ensemble pour la danse break ?. The action-reaction principle is also one of the more important choreographic principles that I learnt from practicing martial arts. For me, breakdance is a contemporary martial art, created by man as a means of coping with a hostile urban environment, one that transforms the body through the violence of its shapes and constraints. Even where there are no enemies to face, no physical feats to accomplish in our everyday lives, the fighting spirit that drives the world of the living finds its expression through breakdancing, in response to the oppression exercised on us by our environment. 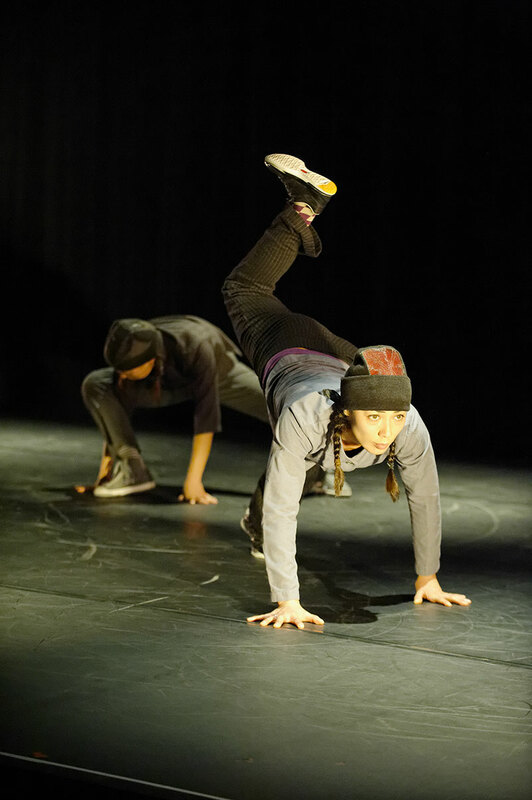 Hip hop dance is a form of discipline and ritual that enables the dancers to reconnect with some of their deepest instincts, such as the conquest for physical strength and territory. I studied science and am greatly inspired by mathematical and geometric principles when I choreograph dance steps for the performance space. Hip hop dance, like many dance forms, is danced in a circle. It came about through gatherings where dancers would create a circle around their performance. Dancers dance for themselves and for the audience who forms the circle around them. The stage, however, is a square space, in which the audience forms one “side” of the square and which is governed by many conventions. The dancer must adopt a different approach for each space. In order to compose a hip hop dance for the stage, one must ask oneself these basic questions: how to transcribe movement for the square space of the stage without simply transposing the original dance?  How to give a successful performance by inhabiting the entire stage space, without being limited by theatrical restrictions when moving from one point to another and creating one’s “set” or “run*” in a circular breakdance or forward-facing Popping dance? How to make the dance legible without diluting and de-energising the movements? I try to think about the dance performance on stage in terms of “usefulness”. For whom, towards what goal is one dancing? 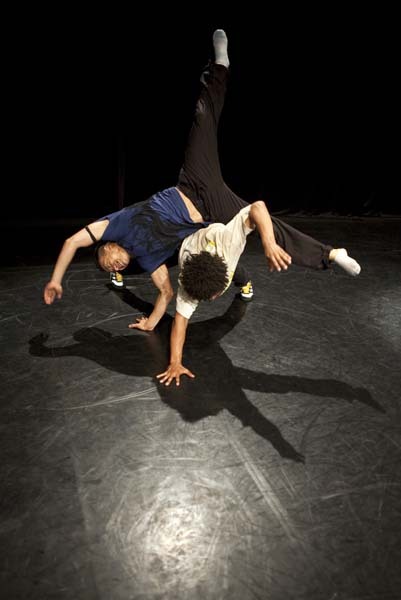 In order to use the entire stage space for breakdancing, the centrifugal force must be broken and redevelop it into dance steps that transcribe straight lines or arcs of circles to make the movements more legible for the audience. This principle forms the basis for the whole of my work. My first production, the solo Square Root, defines the choreographic principles of movement decomposition and recomposition that underlie all of my subsequent productions. Square Root is the mathematical function by which I transform the circular ritual of the breakdance and its contact with the stage. 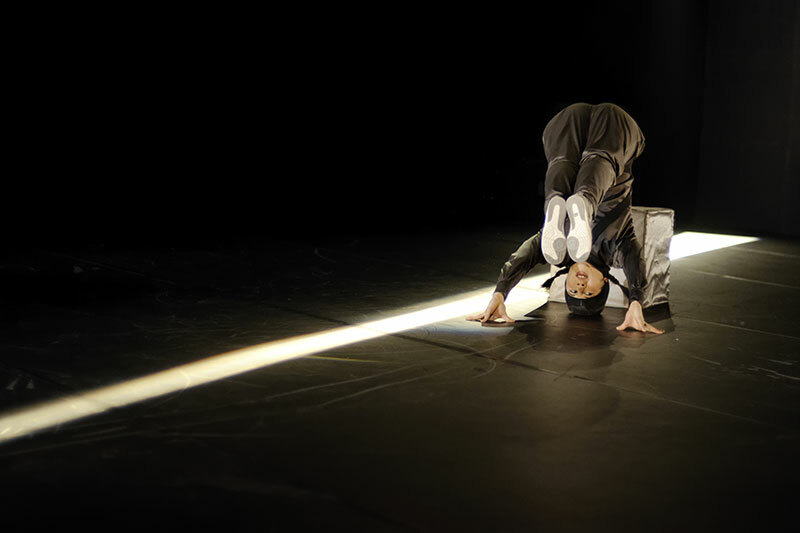 A parallel is made between breakdance, a series of movements inscribed within a “circle of life” and the circular movements of everything within nature. The goal is to assume every corner of the stage, just as the body must assume all the angular constraints of the city. 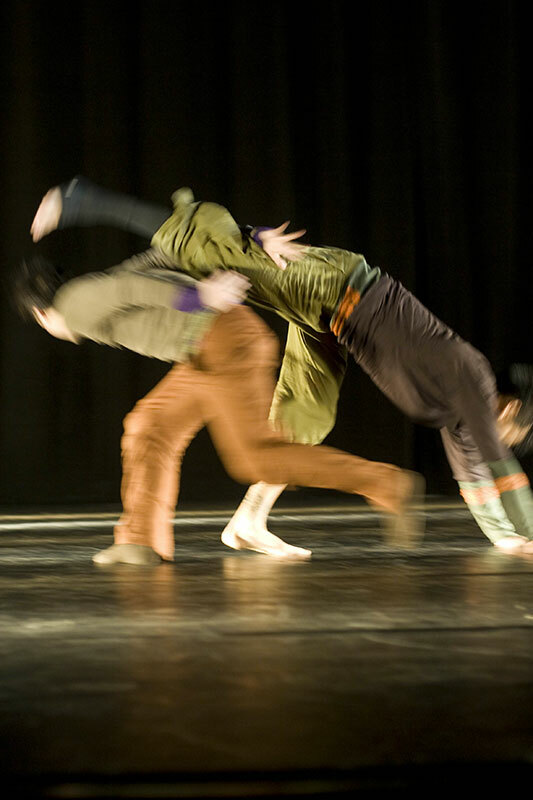 The solo Square Root won second prize in the Masdanza contemporary choreography competition in 2009. In PROMENADE OBLIGATOIRE, eight poppers file past side-on to the audience in a non-stop procession, travelling from one side of the stage to the other towards an unknown destination. The theme of the straight line, which is particularly important to me, is taken to an extreme in this piece: all the different potential ways of proceeding while performing a popping dance are explored. I decided to work on the principle of a non-stop journey across the stage in order to challenge established Popping customs. Popping is a highly cinematographic dance, where many of the effects have been specially devised to be played out in front of the audience and feed its visual perceptions, by constructing lines and shapes, creating mechanical effects, as well as variations in speed, energy and matter… By demanding that the poppers dance almost exclusively in side profile, I force them to transpose their customary technique into a new frame of reference, thus lending their dance a new legibility and new “usefulness”. When or whether to choose to build a fourth wall between the stage set and the audience? If we chose to address or face the audience, what is our purpose in doing so? For me, both these questions form the basis of any desire, or glimmer of an idea to produce a show. Square Root is danced within an intimate space where an inner voice may be heard on the soundtrack, the fourth wall is often present. Yonder Woman is a laboratory “experiment”, the stage is devised as an enclosed experimental space, but one that can be observed by onlookers, who may be seen as the probable initiators of the experiment. Whether or not one takes the onlooker into consideration will have an impact on the movements and intentions of the dancers during the show. Dans Autarcie (….) 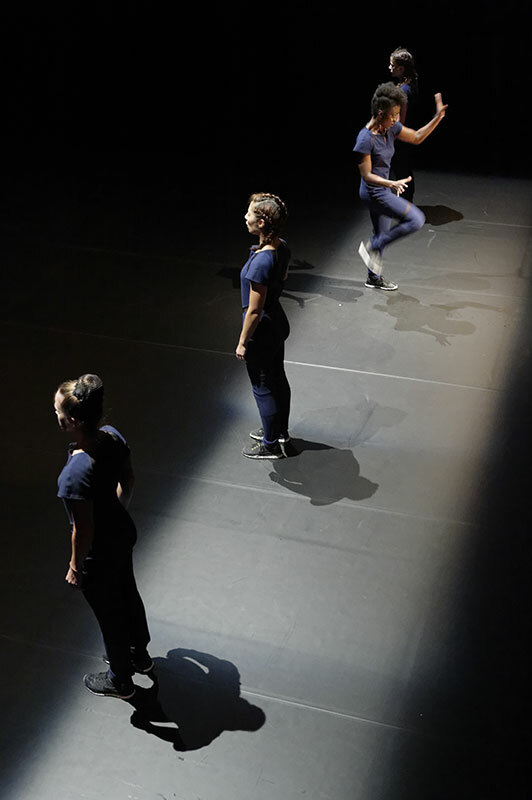 (2013 production), the show’s point of departure rests on directly exposing oneself to the audience’s judgment: the four female dancers form a line of bodies at the front of the stage and execute a sequence of movements together prompting the audience to make a comparison. In PROMENADE OBLIGATOIRE, the eight dancers tirelessly cross the stage in side profile, mostly without sparing a single glance for the audience, and thereby giving the audience the impression that it is a passive observer of the lives of anonymous individuals, as if it were omniscient. 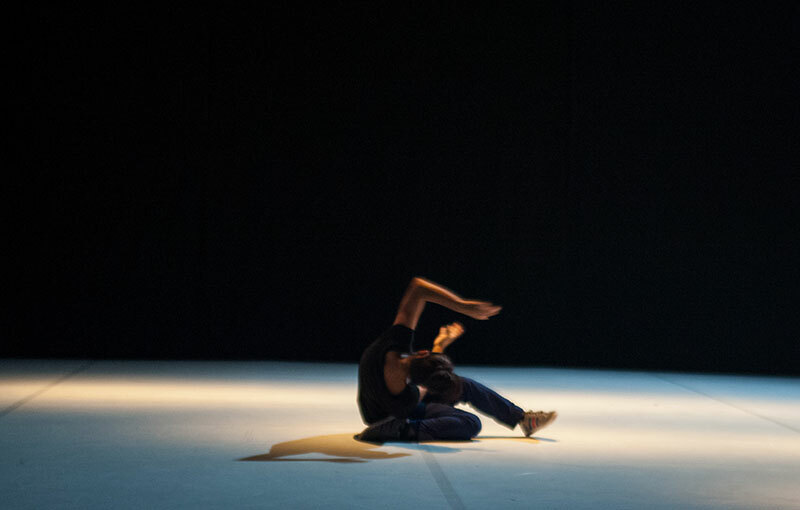 When the dancers finally direct their gaze towards the audience, this relationship is disrupted and the audience is left with a highly unusual impression. The notion of setting, or place, is also very important. If the stage is defined as an enclosed laboratory, a window onto an intimate space or audience, then what of the “off-stage” perimeter? 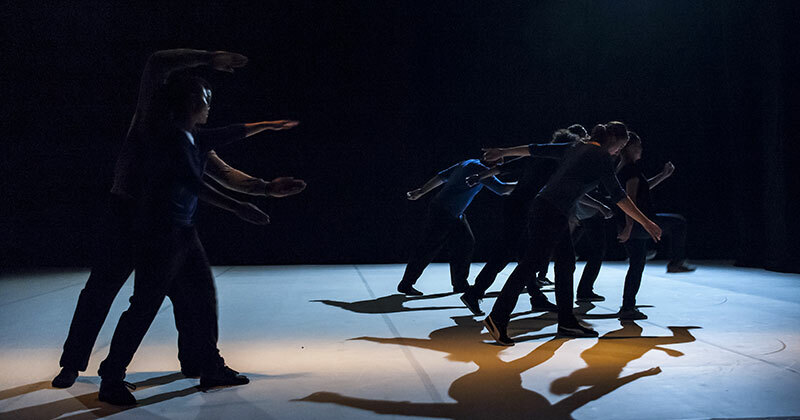 The way in which the dancers enter and exit these highly fixed spaces form part of the choreography. In Square Root, the black box setting is the main constraint in the show. I begin my “ritual” by bowing to each corner of the stage, to which I pay my “respects” with my gift of dance. In Autarcie (…. 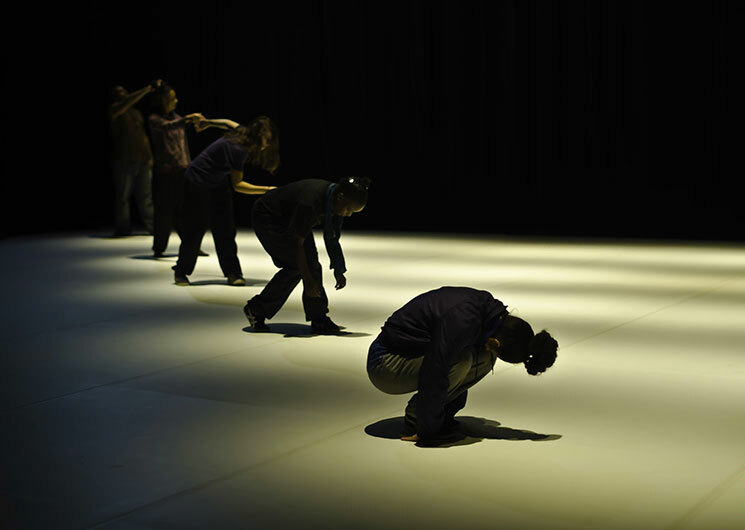 ), the dancers pretend to be in pursuit of one another between two spaces defined by the light: the first forward-facing and public, the second freer and intimate. In PROMENADE OBLIGATOIRE, the stage is never empty, the flow of dancers continues to infinity. By digging deep into the choreographic possibilities peculiar to each of the technical specificities of hip hop dance, I seek to expose the singularities of the body and the approaches to movement. Choreographing a synchronous structure with dancers of different physiognomies and energy levels can easily serve this purpose. I rarely use this form, however, but when I do so it is with caution, as I find it rather artificial. That synchronous structure lends an exceptional quality to the event, one that is at odds with the “chance” element and “disorder” inherent in danced improvisation, whist constitutes one of the founding principles of hip hop dance and occupies an important place in my work. I prefer to use symbols to express the togetherness achieved through being tuned in, through action-reaction systems and contact. One of the challenges in PROMENADE OBLIGATOIRE was to make apparent the state of synchronisation in a non-artificial way. It takes shape in a highly ephemeral way during the process whereby the organic mass formed by the eight dancers undergoes a transformation. In Autarcie (…. ), I decided to get the break dancers and poppers to dance together with their very different dance techniques and performance spaces. 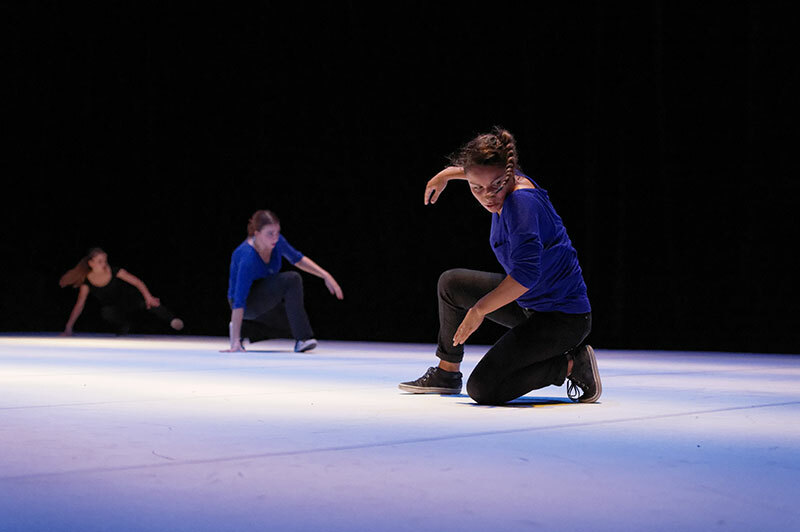 They begin the show with a “dance template” that juxtaposes breakdance and popping movements, and thus explore the notion of uniformity and highlight their differences, which are subtle to start with and then increasingly obvious in the course of the show. Although I am very focused on excellence in execution, I reject any kind of “academic” approach to dance. I like to develop and promote the individualities and specificities of each dancer. My research consists in forging bonds between the movements and space inhabited by the bodies, through an exploration of technical constraints or game-playing. 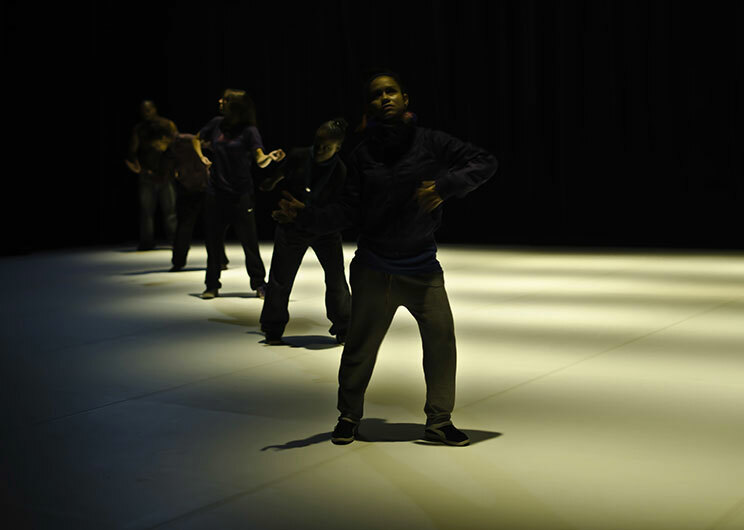 One might ask what is it, aside from the search for technical innovation, that motivates a choreographer to bring a group of individuals or dancers onto the stage? What motivates the audience to come and watch these “chosen few” in this sacred space? To choreograph is to show representatives of humanity projected in an image of a codified world. The bonds between these individuals, the bonds between them and their world, and the bonds between them and the “otherwhere” or the “other” represented by the audience, represent the path that each individual must follow, either as a performer or as an onlooker. When I produce a show, I do not try to assemble all the elements of a story, a moral or a collection of images. I simply try to engage the dancers and those who observe the different ways of “togetherness” in an experience. Hip hop dance is associated with breakbeat music, rap instrumentals and percussive electronic music where the accent is sounded on the second beat of the music. Music and hip hop dance are closely linked and have fed off one another from the start. Like in hip hop music with its warrior-like or industrial incantations, the body of the hip hop dancer is tensioned by the constraint brought into play and is in a constant state of struggle with itself: its movements seem to want to explode, break free from the body’s limitations. The rapid, repetitive rhythm of the breakbeats does not encourage movement to develop fully in space and time, to the contrary it imposes the need for speed and short and efficient trajectories between the different poses and points of support. The more a breakdancer is capable of switching between one beat of the music and another, alternating between the most extreme positions and the most different points of support, the more impressive the dance. The more able a popper is to execute his/her series of distorted poses to an unknowable inner rhythm, highlighting in many and varied ways the repetitive loops of electronic music, the more fascinated the onlooker will be. Hip hop music is a source of energy and creativity for the dancer. I am interested in pure movement, movement that resonates in bodies still suffused with the essence of the music from which it arose. For me, the movements of the hip hop dancer, even though it only came about from a particular type of music, stands alone, in its own right, full of rhythm and inner energy. It can therefore be transposed to, and as a result enriched by, all types of music. For my productions, I use music that opens up opportunities for dance, rather than contain it or provide a framework. To my mind, music should neither orchestrate nor embellish. The dancers should neither totally identify with the music, nor stand totally apart. They should inhabit it as if fulfilling the function of an additional instrument, playing their part perfectly, in harmony with the whole. The music for my solo Square Root was scored by cellist, Raphaële Murer, after listening to the danced score that I had previously choreographed in silence to rhythms memorised by my movements. In the score for the Yonder Woman duet, the earthy percussive energy so beloved of breakdancers nurtures the principles of arrhythm and polyrhythm. In the case of these rich rhythms, which offer so many possibilities, dance can evolve with the dancer’s changing perceptions: the time allowed for each movement changes according to the dancers’ impressions and the inflections they choose to give them. 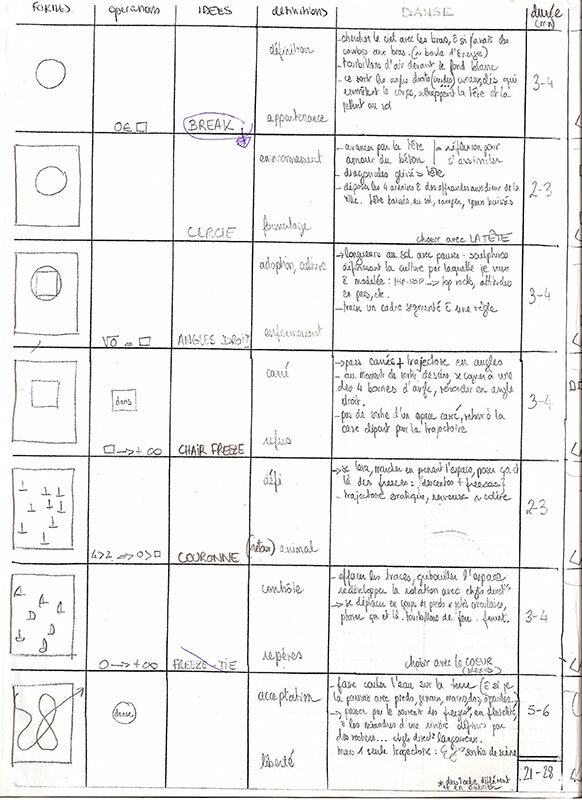 The original score for PROMENADE OBLIGATOIRE, composed by Benjamin Magnin, who was also responsible for the music for Yonder Woman pis structured around the themes of the loop, the beating of time and sound distortion. It requires the poppers to work to a strict framework with an infinite variety of subtleties, within which they must explore their freedom and develop their dance. I establish a system of tasks, wherein they must dance to a rhythm that is sometimes fixed and sometimes free, comprising movements that they must execute to visual impulses and thus experience differently depending on the moment in the score at which they occur. Likewise, the score for Autarcie (…. 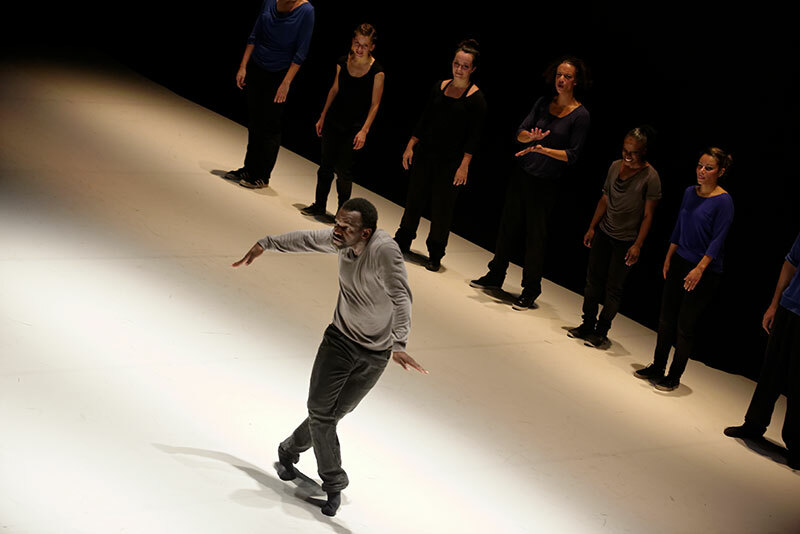 ), composed by Sébastien Lété, encourages the dancers to pulsate, whereas the choreography imposes a game of power play requiring them to make jerky moves or movements at odds with the rich score, thus lending an incomplete mood to their dance. My next production, bal.exe, involves eight poppers dancing to pieces of chamber music played on stage by five classical musicians. Brahms’ quintet for clarinet is the main piece. It is a romantic, somewhat nostalgic, piece, whose score varies enormously in rhythm and measure. A few brief moments in the score are conducive to dance, but many more besides prompt contemplation. The dancers interpret the musical structure according to the moment: they follow one of the paths followed by the score, they continue along that path until it disappears, after which they resume by tuning in to one of the instruments, only to subsequently distance themselves by focusing solely on their dance… In this distancing process, they alternate between identifying with the music and building inner rhythms in which they become submerged, allowing them to slip away in order to succumb to new influences. In each of my productions, the dancers are inhabited by rhythm sequences peculiar to them alone, and freely explore their movements within a complex system of constraints, wherein the score is but one of the constituent elements. React to this article by writting us a comment !